The demand for avocados in the U.S. is rising at a breakneck pace. In 2015, Americans consumed double the amount of avocados as compared to 2008. While this growing demand for avocados has changed the dynamics of the avocado, produce, retail, and restaurant industries as a whole, the avocado boom has had some unintended consequences. So, what does this have to do with Monarch butterflies? To keep pace with the rising demand for avocados in the U.S., farmers in Mexico are clearing forests in order to grow more avocados. This soaring demand for avocado consumption has be met in some way, and unfortunately this is coming at the cost of deforestation in Mexico. The economics of avocados are tempting. The fruit yields high prices in the U.S. and American taste buds are demanding more and more avocados each year. Inarguably, the desire to make some quick cash through avocados is the economic incentive leading to deforestation in Mexico. How is this related to butterflies? 80% of avocados consumed in the U.S. come from Michoacán, Mexico, the only Mexican state permitted to export avocados to the U.S. up until 2016. Michoacán also happens to be the winter home of monarch butterflies. 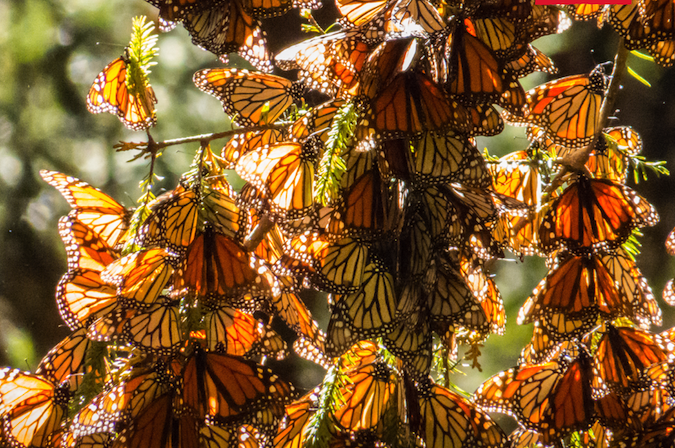 Every winter, monarch butterflies start their migratory journey from Canada and the United States to the pine forests of Michoacán, covering more than 2,500 miles over the course of their trek. The black and orange spotted butterflies are attracted to the warm temperatures of the Michoacán forests and spend their winter months amongst the beautiful pine groves in this Mexican state. As farmers clear pine forests in Michoacán to pave way for avocados, the winter home of butterflies is imperiled. Clearing forests is significantly disrupting the local ecosystem and impacting the habitat of monarch butterflies. What avocados can I choose to protect Monarch butterflies? Equal Exchange avocados are sourced from a small farmer cooperative in Michoacán called Pragor. The founding members of Pragor coop are multi-generational farmers who have owned their own farms for over 60 years. This land was passed on to them by their fathers and grandfathers. 1. The coop has a strict criteria for enrolling new farmer members. One of the criteria is that farmers must have been growing avocados organically for a minimum of 6 years. Since the newer avocado farms are a result of deforestation, this measure ensures coop members are not contributing to deforestation. 2. The coop has begun a tree planting project using their Fair Trade Premium dollars. Working in conjunction with the federal government, growers are given pine seedlings as a means to encourage reforestation. 3. Lastly, Pragor farmers are pioneers in organic and fair trade avocados in Mexico and the world. They are small scale farmers who own an average of 8 acres and were drawn to organic production as a means to take care of the environment and their communities. This commitment to sustainable growing predates the rising demand for avocados. Through these measures and safeguards built into the Pragor model, the coop ensures their members are not contributing to deforestation and, in fact, are promoting reforestation efforts. Pragor members make up a small percentage of the avocado industry; they are 25 out of 17,000 registered avocado farmers in Michoacán. The unfortunate reality is that this trend of deforestation will likely continue, but the good news is that we have a choice to consume ethically grown avocados. Minty Apple Kombucha Smoothie - Delicious, Healthy, and Guaranteed to Wake You Up!